Valli Little is one of Australia's favourite food writers and food editor of the popular magazine delicious. 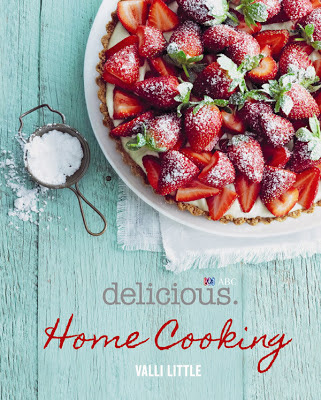 This new cookbook features Valli's favourite home cooked recipes, which are super easy, look fantastic and taste delicious. Seasonal chapters make this cookbook really easy to follow and ensures that you are always cooking with the best seasonal produce. It's smart. It's also a very good looking cookbook with a matching full colour photo for each of the 120 recipes contained within. You won't find any complicated restaurant style dishes in this cookbook either which is refreshing, it really inspires home cooking. To start you off and get you in the mood for Summer, Valli has kindly provided readers of The Food Mentalist with her recipe for Strawberry Tart w/ Basil Cream which is featured on the front cover. You will note that it is a simple recipe with limited steps and easy to follow instructions. Oh, and it looks divine! Just for presentation, I like to keep some of the strawberries unhulled. The bright green leaves add an extra burst of colour to this tart. Place the amaretti in a food processor and whiz to fine crumbs. Add the butter and pulse a few times to combine, then press into the base and sides of the tart pan. Chill for 30 minutes to firm up. Place the strawberries in a bowl and toss with the icing sugar. Set aside. Place the cream and lime zest in separate bowl and beat with electric beaters until stiff peaks form. Strain the passionfruit pulp into the cream mixture, pressing down with the back of a spoon to extract as much juice as possible and discarding the seeds, then gently fold to combine. Fold in the basil and yoghurt. 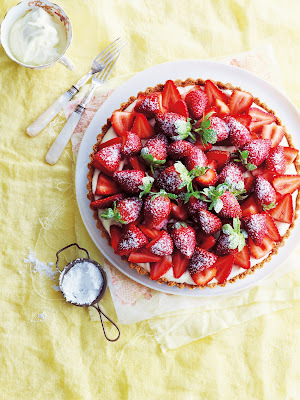 Fill the tart shell with the basil cream and arrange the strawberries on top. Serve the tart dusted with extra icing sugar. * Available from delis and gourmet food shops. Stay tuned for another Summer recipe from Valli's cookbook - Peppered Tuna w/ Green Tea Noodles. Yum. The Food Mentalist road tested Home Cooking by Valli Little compliments of Harper Collins Publishers Australia. This is not a sponsored post. * Photos supplied by Harper Collins Publishers. Basil and strawberries do go so well together,love recipes which are a little different. Wow nice recipe I love strawberries. I’m so glad when strawberries are finally in season and growing in my garden. They rarely make it to the fridge as I eat them as soon as I choose them. 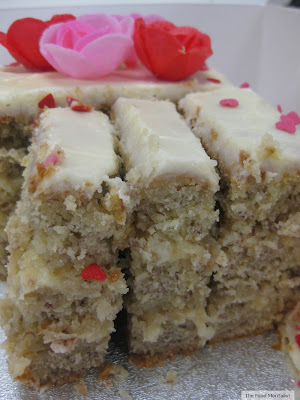 What a delicious recipe to enjoy with family and friends. What a great idea to keeping the strawberries. I love the recipes which are looking different. Thanks for share.